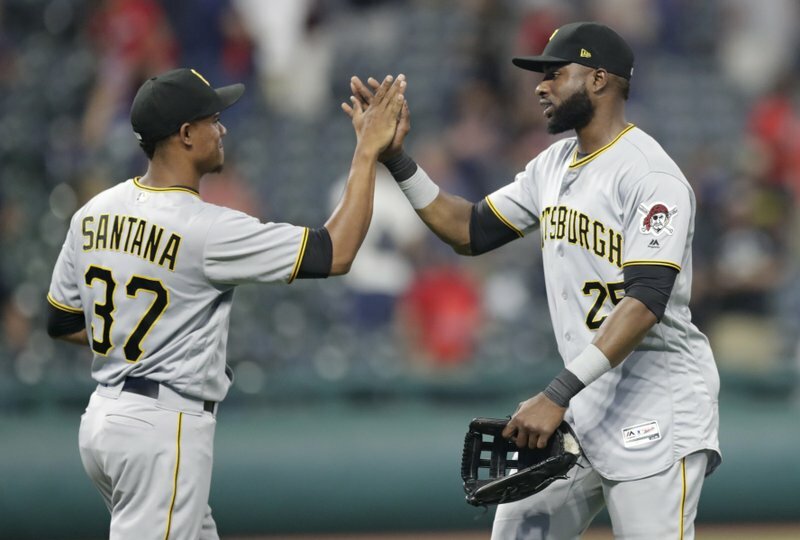 CLEVELAND (AP) — Starling Marte, Gregory Polanco and Josh Bell each hit a two-run homer, and the Pittsburgh Pirates beat the Cleveland Indians 9-4 on Tuesday night for their 11th straight win. The Pirates routed the Indians for the second straight night. Marte homered in the first inning, drove in three runs and extended his career-high hitting streak to 17 games. Polanco homered and Corey Dickerson tripled in two runs when Pittsburgh scored five times in the second. Bell hit a home run in the fifth. The Pirates have homered in a season-high nine straight games, hitting 22 home runs in that span. Pittsburgh has won 11 in a row for the first time since Sept. 12-22, 1996. The Pirates have won 13 of 14 and are 17-8 since June 24. Pittsburgh has outscored its opponents 43-8 in the last five games. Joe Musgrove (4-4) allowed two runs and five hits in seven innings for his first win since June 29. Shane Bieber (5-2), called up from Triple-A Columbus to make the start, allowed seven runs in 1 2/3 innings. The short outing forced the Indians to use seven relievers. PHILADELPHIA (AP) — Trevor Plouffe hit a three-run homer off outfielder Enrique Hernandez with one out in the 16th inning, and Philadelphia outlasted Los Angeles in a game that lasted nearly six hours. After using eight pitchers, the Dodgers turned to Hernandez (0-1) in the 16th. He got Nick Williams to fly out, then walked Jesmuel Valentin and Jorge Alfaro before Plouffe hit an opposite-field shot for his first homer of the season and second career walkoff, ending the game after 5:55. Eight Phillies relievers combined to allow one run and six hits over 11 impressive innings, with Vince Velasquez (7-8) pitching the top of the 16th. Velasquez, who tossed seven scoreless innings in the second game of Sunday’s doubleheader win against San Diego, made his first relief appearance since 2015. The game, which was delayed 14 minutes at the start by rain, ended at 1:14 a.m. The teams combined to use 18 pitchers. ARLINGTON, Texas (AP) — Khris Davis’ three-run homer in the 10th inning capped Oakland’s comeback from an eight-run deficit. Davis went deep against Austin Bibens-Dirkx (2-3) for the Athletics’ fourth homer of the night — their third consecutive game with that many. Oakland’s 92 homers on the road lead the majors. The Rangers led 10-2 after the sixth inning. Oakland scored three in the seventh and four more with just one hit in the eighth. Stephen Piscotty’s solo homer leading off the ninth tied it against Keone Kela, who blew his first save of the season in 24 chances. Elvis Andrus hit his first career grand slam and tied his career high with five RBIs for Texas, but his error in the eighth inning on a potential inning-ending double play ball aided Oakland’s comeback. Jeurys Familia (2-0) won his second game for the A’s in his second appearance for the club since being acquired from the Mets on Saturday, pitching two perfect innings. Blake Treinen retired the side in the 10th for his 25th save in 29 chances. BALTIMORE (AP) — Tim Beckham and Jonathan Schoop homered and drove in three run each, and Baltimore withstood four long balls by Boston in a victory. Baltimore closer Zach Britton was not used in a save situation and was traded to the Yankees for three prospects after the game. Brad Brach, another reliever the Orioles want to trade, worked the ninth in the rain for his 11th save. J.D. Martinez homered twice to raise his season total to 31, and Betts and Blake Swihart contributed solo shots for the Red Sox. Coming off the disabled list to make his first big league start since May 31 after recovering from left biceps tendinitis, Boston left-hander Drew Pomeranz (1-4) gave up four runs and six hits in 4 2/3 innings. ST. PETERSBURG, Fla. (AP) — Masahiro Tanaka pitched a three-hitter, and Austin Romine drove in two runs as the replacement for again-injured catcher Gary Sanchez. Tanaka (8-2) retired his first 12 batters before C.J. Cron singled leading off the fifth. He struck out nine and walked one, improving to 6-0 on the road. It was the sixth major league complete game and third shutout for Tanaka, his first complete game since a three-hit shutout at Boston on April 27 last year. Yonny Chirinos (0-2) allowed three runs and six hits in 6 2/3 innings. MILWAUKEE (AP) — Tyler Saladino’s bases-loaded sacrifice fly in the 10th inning lifted Milwaukee. Lorenzo Cain led off the 10th with single up the middle off Matt Grace (0-1), the sixth Nationals pitcher. He moved to third on Christian Yelich’s single to right. After an intentional walk to Jesus Aguilar, Grace struck out Travis Shaw, setting the stage for Saladino, who lifted a fly ball to shallow left-center. Cain scored standing up as left fielder Juan Soto’s throw sailed off line. Adam Eaton hit a three-run homer for the Nationals, who also played without Bryce Harper in the starting lineup because of illness. CINCINNATI (AP) — Austin Gomber took a no-hitter in the seventh inning and Dexter Fowler hit a two-run shot in the 11th, leading St. Louis over Cincinnati. Mired in a season-long slump, Fowler connected off left-hander Amir Garrett (0-2) for only his second homer while batting right-handed. Sam Tuivailala (3-3) escaped a two-on threat in the 10th. Bud Norris got his 19th save in 22 chances, one night after he took a loss. For the second straight night, a Cardinals rookie went deep into the game without allowing a hit. Daniel Poncedeleon threw no-hit ball for seven innings in his major league debut Monday before the Reds rallied against Norris for a 2-1 win featuring Eugenio Suarez’s homer. Gomber waited on the mound during a 7-minute, 30-second delay to the bottom of the seventh when the ballpark’s fire alarm went off. Joey Votto singled with one out for the Reds’ first hit, and Suarez followed with his 21st homer, ending the rookie’s debut as a starter. DENVER (AP) — Tony Kemp lined a go-ahead single off closer Wade Davis as part of a six-run 10th inning and Houston beat Colorado. Kemp’s one-out hit brought in Josh Reddick, who led off the inning with a single to center that Charlie Blackmon misplayed and had bounce by him. A hustling Reddick wound up on third and set the stage. Davis (0-3) later surrendered a two-run triple to pinch-hitter Kyle Tucker and a two-run homer to George Springer as the Astros beat the Rockies for the seventh straight time in a streak that dates to 2013. Davis was charged with five runs. Hector Rondon (2-2) pitched a clean ninth to earn the win, with Brad Peacock finishing the 10th. CHICAGO (AP) — Clay Buchholz pitched effectively into the seventh in his return from the disabled list, Steven Souza Jr. had three hits and an RBI and Arizona won its third straight. Buchholz (3-1), sidelined since June 25 with an oblique injury, walked two and struck out five in 6 2/3 innings as he lowered his ERA to 2.38 in eight starts with Diamondbacks. SEATTLE (AP) — Steven Duggar scored from second base on a throwing error by Dee Gordon with two outs in the ninth inning and San Francisco beat Seattle. Pinch-hitter Pablo Sandoval hit a slow roller toward second base that Gordon charged from the outfield grass. Sandoval was going to beat the play, but Gordon still tried a rushed throw, and Ryon Healy was unable to handle it as it bounced toward the Seattle dugout, allowing Duggar to score. Duggar had singled with one out against closer Edwin Diaz (0-3) and advanced when Alen Hanson grounded to the mound. Tony Watson (3-3) worked the eighth inning, and Will Smith pitched the ninth for his fourth save. ANAHEIM, Calif. (AP) — Carlos Rodon pitched two-hit ball into the eighth inning, and Yoan Moncada homered in the seventh for Chicago. Rodon (3-3) took a no-hitter deep into the sixth and finished with eight strikeouts in 7 2/3 innings. He yielded three walks, but worked quickly and smoothly while the White Sox earned back-to-back victories for the second time in July. The Angels chased Rodon and rallied in the eighth with David Fletcher’s RBI double and Mike Trout’s two-out, bases-loaded walk from reliever Juan Minaya. Jeanmar Gomez then got Justin Upton on a shallow flyout to end the rally. Felix Pena (1-1) pitched six innings of four-hit ball for the Angels (50-52), who fell two games below .500 for the first time all season. KANSAS CITY, Mo. (AP) — Burch Smith picked up his first win in nearly five years, and Mike Moustakas and Salvador Perez homered for Kansas City. Smith (1-1) gave up just one hit — a single by Niko Goodrum to leadoff the fourth — and walked two while striking out six in 6 1/3 innings. He got his second career win, and first since Sept. 15, 2013, for San Diego against Atlanta. Injuries limited the right-hander’s career to just 5 1/3 innings the next three seasons. The Royals obtained Smith in the Rule 5 draft last December. He was making his third start of the year after beginning the season with 24 relief appearances. Wily Peralta gave up at triple to Nicholas Castellanos and a run-scoring grounder to Jeimer Candelario in the ninth before finishing up for his fifth save. Whit Merrifield doubled to open the first and scored on Moustakas’ 20th homer, into the Royals’ bullpen, in the first off Jordan Zimmermann (4-2). MIAMI (AP) — Wei-Yin Chen pitched six innings and scored the first run of his career to help Miami beat Atlanta. J.T. Realmuto hit his 13th homer of the season for Miami and drove in four runs. Starlin Castro added a three-run homer, his eighth, and Brian Anderson had three hits and scored three times. Chen (3-7) allowed three runs and five hits. He doubled to start a five-run fifth for his first extra-base hit in 82 career at-bats, and raced home from third on Realmuto’s grounder, barely beating a poor throw by shortstop Dansby Swanson. Julio Teheran (7-7) matched a career high by allowing nine runs, seven earned, in 4 1/3 innings. The Braves committed three errors, including one by Gold Glove center fielder Ender Inciarte that led to two unearned runs. NEW YORK (AP) — Devin Mesoraco hit an early three-run double and made a heads-up play on defense that helped Zack Wheeler and New York defeat San Diego. Michael Conforto launched a two-run homer, extending his recent tear at the plate, and Wheeler (4-6) pitched seven crisp innings to win his second consecutive start. Before that, the right-hander went 13 outings without a victory dating to April 29 in San Diego — the longest stretch without a win for a Mets starter in 20 years. Before the game, New York put Yoenis Cespedes on the 10-day disabled list again. The team said it was awaiting a second opinion before deciding whether the oft-injured slugger needs surgery on both feet that could require an eight-to-10-month recovery. Padres left-hander Eric Lauer (5-7) struggled through the early innings once again. He threw 35 pitches in the first, giving up Mesoraco’s bases-loaded double with two outs, before serving up Conforto’s 13th homer after a leadoff walk in the third. TORONTO (AP) — Jose Berrios and two relievers combined on a five-hitter, and Eduardo Escobar hit a three-run home run for Minnesota. Berrios (10-7) allowed four hits, three of them singles, in seven innings. He walked one and struck out nine to win for the second time in three starts. Trevor Hildenberger worked the eighth and Ryan Pressly finished for the Twins, who have won two straight following a three-game losing streak. Blue Jays rookie left-hander Ryan Borucki (0-2) retired the first 10 batters he faced before Eddie Rosario and Brian Dozier hit back-to-back singles in the fourth. Borucki retired the next two batters to end the threat.